Right after the final reveal of Allietare last January, I started making colour plans for the next Bonnie Hunter mystery. For Allietare I pretty much stayed in the box, and only changed one colour from Bonnie's palette. This time, I wanted something totally different! My plan was to go with pure blue and white, and carefully manage the values to reveal the pattern. Cool and elegant, I thought. Sometime mid-summer I got an email announcing the release of this gorgeous Flamingos collection by Melissa Ybarra of Iza Pearl Design. 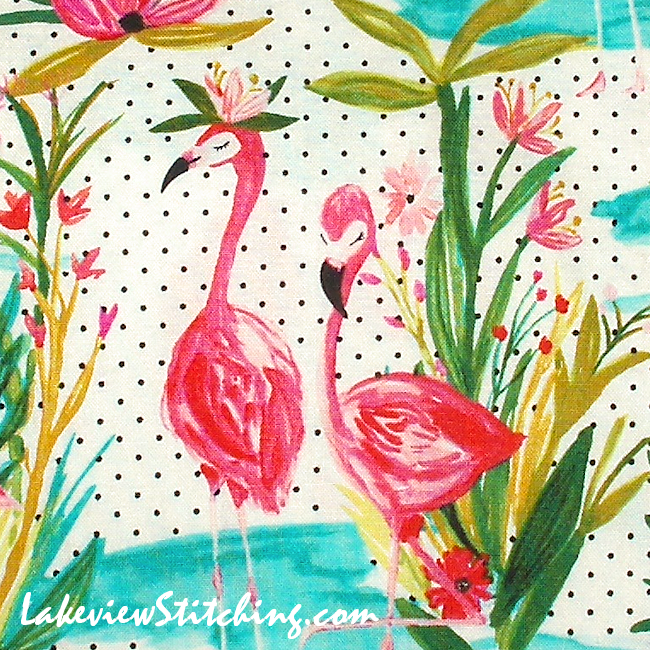 I love that watercolour style of print, I loved all the greens and aquas, and I've always loved flamingos. Wouldn't it be crazy, I suddenly thought, to forget the blue and white, and somehow use this collection for Bonnie's next mystery? I particularly liked all the blenders with the mini flamingos. But, I squelched down the idea. I had a good plan. Then, for the first Slow Sunday Stitching link up after my summer break, hostess Kathy had a photo of a flamingo pool toy. I know Kathy has done Bonnie's mystery for several years, so there was that association again -- Flamingos, and Bonnie! I went shopping. However, Bonnie's announcement of the new mystery, En Provence, was very tempting too. 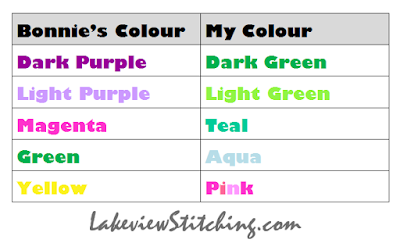 Her colourway is almost half purple, and she mentions a "halo" of magenta. Even though purple is not my favourite colour, this sounds very promising to me! The effect with dark and light purples, and some kind of bridge in magenta, could be really gorgeous. And yellow sunflowers! I love those too. Dilemma. In the end, I still didn't have enough purple in my stash. And it turns out that flamingos are completely appropriate anyway! The word flamingo originates via Spanish or Portuguese from the old Provençal word for flame, and the Greater Flamingo nests in The Camargue nature preserve which is... en Provence. So that is a surprising amount of alignment for a theme that was supposed to be completely different! I had no idea there were flamingos in France. I want to use all the most electric lime greens that I have, a wide range of pinks and corals, and very cool white backgrounds. 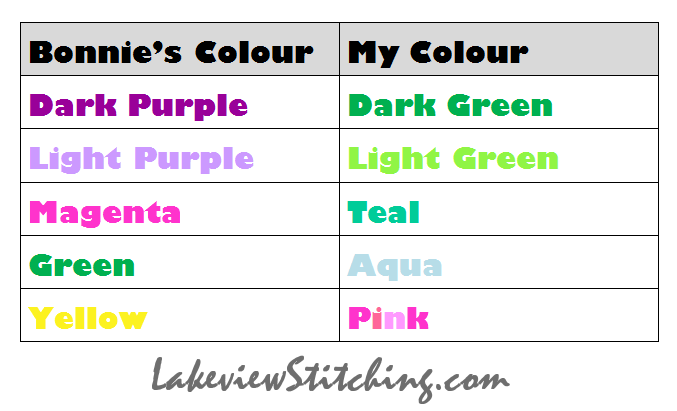 Although, if the first clue involves sewing the light and dark greens together, I will back off those really bright ones, because they drown out the darks. 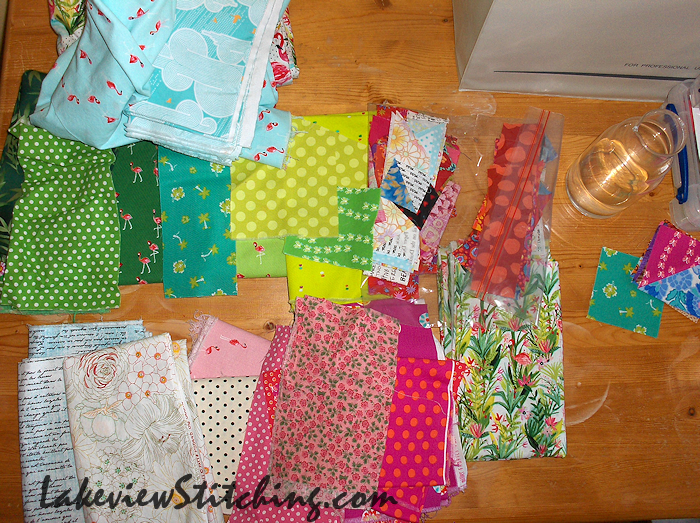 I'm hoping to sew both the light and dark green to the teal. That will look great! It looks like a few of my Allietare leftovers (in the baggie) will work too. Ten days to go! And no, Allietare is not finished, and my back is no better, but I am determined that it won't stop me completely. If I can get around half of the clue made each week, I will be happy. I have a lot of border fabric, so that will give me some options. Who else is in this year? You are a brave soul indeed. I was researching a quilt retreat in Provence in the spring but it was waitlisted by the time I contacted them. Too bad. I plan to be in Europe mid April and it would have been fun. Bonnie's mystery quilt showed up at the same time so I read over the instructions carefully then decided that I did not need to start yet another quilt . It will be fun to follow along this time. Your flamingo plan looks fun. What amazing fabric - impossible to resist when the signs all align. Sorry your back is no better - but pleased to see your enthusiasm and ideas are unaffected. Great goals - will be fun to follow. Thanks very much, Jillian! As you predicted, I have been redesigning some UFOs during my enforced rest, and I've managed to make a couple of them smaller. 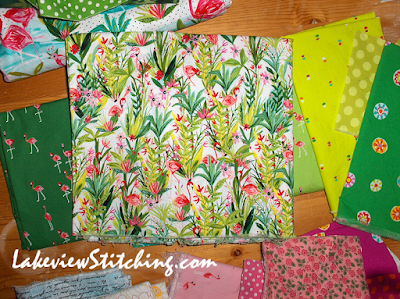 But then one project jumped from a lap quilt to queen sized, and I thought it was time to actually touch fabric again! Oh, gosh! 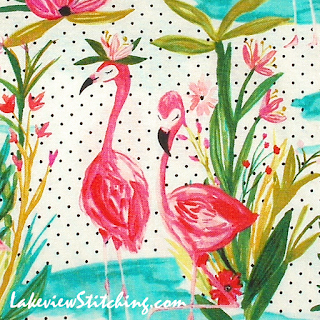 I LOVE the flamingo fabrics. My sister would love them even more because she is the flamingo queen. I just made her some flamingo pillowcases for Christmas. Anyway, I stray...I think you are going to have one fun quilt when all is said and done! Can't wait to see the finish! 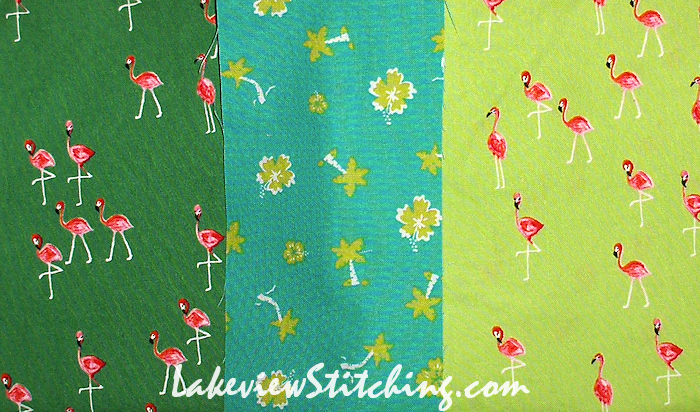 When I saw your flamingo fabric for Bonnie's quilt, I thought how absolutely perfect to represent the Camargue, (which spans between Languedoc and Provence). When I saw Bonnie's challenge "en Provence" a while back I was very tempted to participate, but my plate is very full right now, so I will participate vicariously through your quilt. 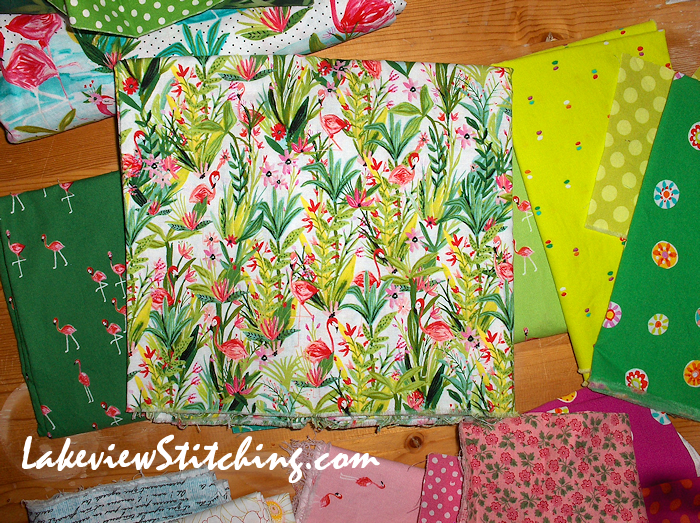 I love the flamingo fabrics, love the colour choices, and am looking forward to seeing your interpretation of the topic and the fabrics. Sorry that your back is not better but kudos to you for persevering anyway, and hoping that the issue resolves soon. Thank you! I'm hoping that my back will correct itself if I have a sufficiently engrossing distraction. With luck this will do the trick! Looking at your color choices is quite interesting. I love the flamingos; also those colors are personally attractive. It will be fun to watch yours develop. 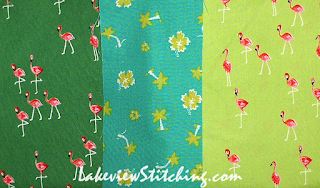 I love the flamingos and the look of your pile of fabric - it will be fun to see how this evolves. I hope it will help distract you from your bad back. 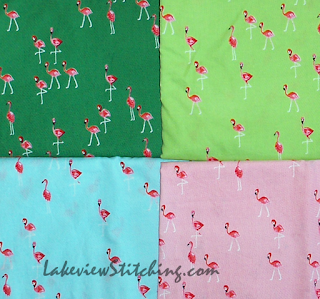 Your flamingoes will add personality to your quilt! Drat! I was hoping to read that your back was healed and you were stitching with wild abandon! But, I agree with another who left the comment. . . "brave woman!" I'm glad you aren't letting pain totally rule your day! Besides, the flamingo story and color ways are just too aligned not to participate! Yes, you and me both, Terry! 36 hours until the first clue, and I am doing everything I can to avoid starting a different new project right NOW. I don't know...I may crack and sew a few triangles tomorrow. Just to see! Flamingos! They are a camp item here in St Louis. Back in the fifties people were putting them on their front lawn and now they are kind of a St.Louis icon. I love your color choices. It will be interesting. Sorry about your back. That has to be very irritating to say the least. After seeing your flimsy, I just had to look back to see how you decided on your color scheme. It's always interesting to me how a grain of an idea will suddenly be supported by prompts and clues from outside sources (the Quilt Muses at work! 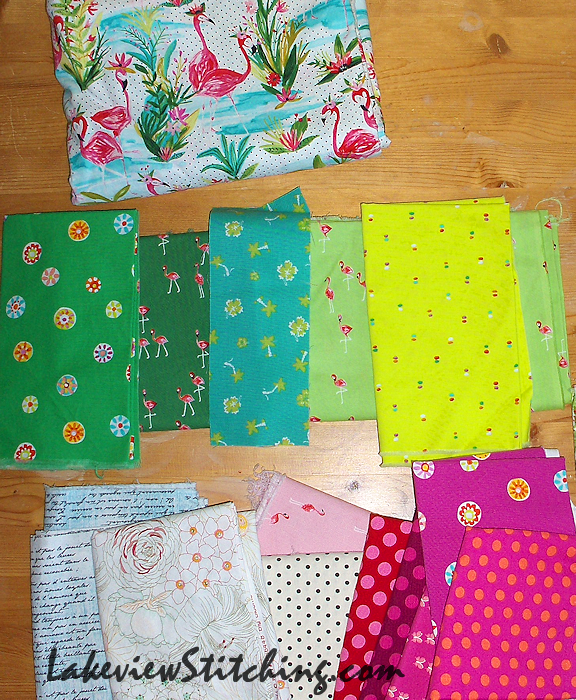 ), then some input from your stash and before you know it an inspired journey has begun! Good for you! !